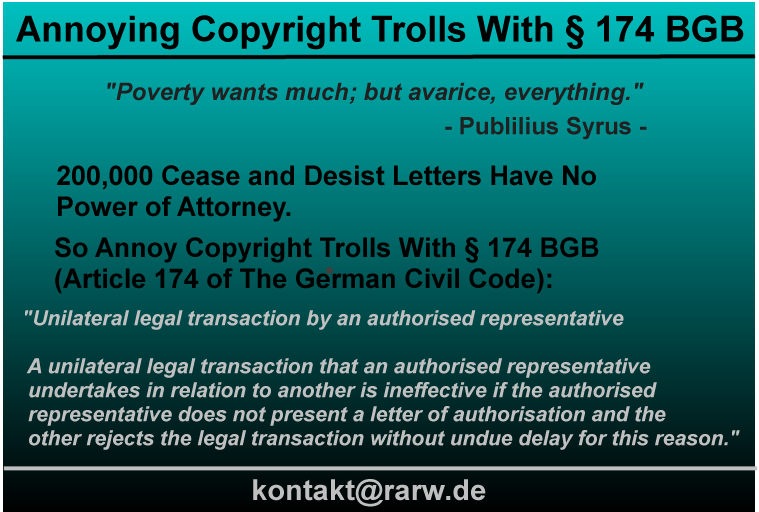 "Annoying Copyright Trolls With § 174 BGB "Poverty wants much; but avarice, everything." Publilius Syrus 200,000 Cease and Desist Letters Have No Power of Attorney. So Annoy Copyright Trolls With § 174 BGB (Article 174 of The German Civil Code): "Unilateral legal transaction by an authorised representative A unilateral legal transaction that an authorised representative undertakes in relation to another is ineffective if the authorised representative does not present a letter of authorisation and the other rejects the legal transaction without undue delay for this reason." kontakt at rarw dot de"
Are you a DSL customer or small business owner with online auctions and / or Web pages in Germany? Especially foreign DSL subscribers and online business owner must know that in Germany there are three very bad business models with "Abmahnungen" (Warning Letters or Cease and Desist Letters) that turn online infringements into profit. The profit comes from out of court settlements between €250 to €2,000. Many DSL subscribers in Germany receive a copyright infringement warning letter for publicly exchanging a copyright-protected blockbuster film or music album. In your country abroad it is quite normal downloading films and music on Bittorrent websites like Popcorn Time and so on. It may be illegal but the copyright holders have no right to sue you. In Germany it is completely different. Copyright holders have the right to sue perpetrators of online piracy. Before they go to court they have to send you a copyright infringement warning letter, § 97 UrhG (German Copyright Act). In my opinion Germany is the only country in the world where "Turn Piracy Into Profit" is the most successful business model for the international content industry (Hollywood and music labels). On the LinkedIn account mentioned above you will find more in-depth information. If you have other legal problems in Germany e.g. a traffic accident or if you would like to found a company in Germany we might help you as well. Before wasting your money you can calculate for free the lawyer's fees and judicial costs in Germany on our page "lawsuit". If you would like to live in Spain our Spain Property Service may help you find, rent, let or sell your home on the Costa Brava in Spain. Of course we also manage the foundation of a Spanish Limited Company to save taxes or start a new business in Spain. Learn how you can rescue your fortune and invest safely with our consumer protection, escrow and price-cutting service. Zurück von "German Law Firm of Rechtsanwalt Rainer Wiesehahn in Germany" zum Index von "rarw.de"